Hamilton has changed a lot over the last few years as the number of people living here has grown. More people leads to more traffic and the need for more roads. Your mission for today was to find out more about the Waikato Expressway and how it will help people in the future. You braved the early morning traffic to head across town to meet with Bridget Burdett. Bridget is a transport engineer who works on projects to make it easier and safer for people to walk, cycle and drive in cities and on country roads. 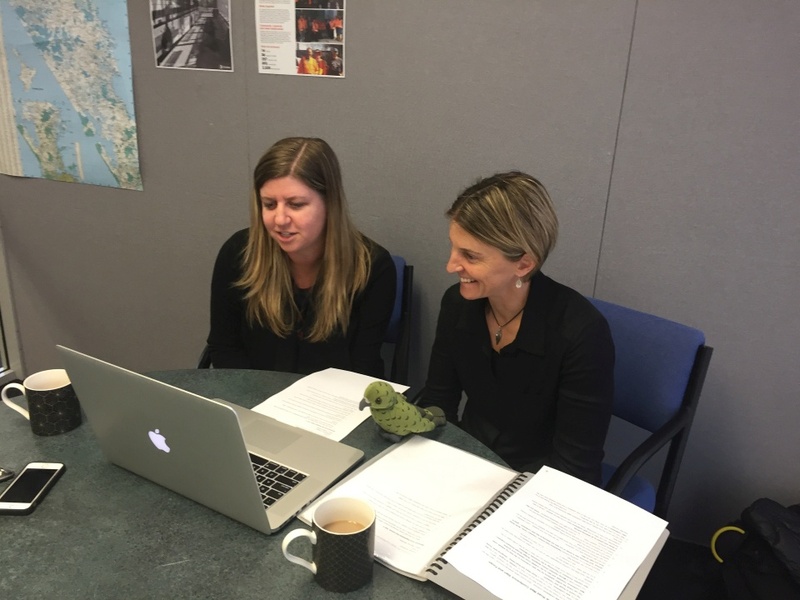 Bridget was keen to share her knowledge and answered questions from Jesse and Billy during the web conference. Jesse and Billy are home schooled. They travel around the country with their family in a caravan and were keen to find out more about how roads can be designed to make them safer. Bridget explained that roads are not just designed for drivers. Roads also need to meet the needs of cyclists, pedestrians, elderly and people with disabilities. Shared pathways, cycleways, footpaths, parks and other public facilities can all be built alongside new roads. Before a new road can go ahead people living in the area must be consulted. You can help make new roads better by sharing your ideas with road designers. You can listen to the recorded web conference and watch the video to find out more. Roads need to consider all users, the environment and the impact they have on people living in the area. 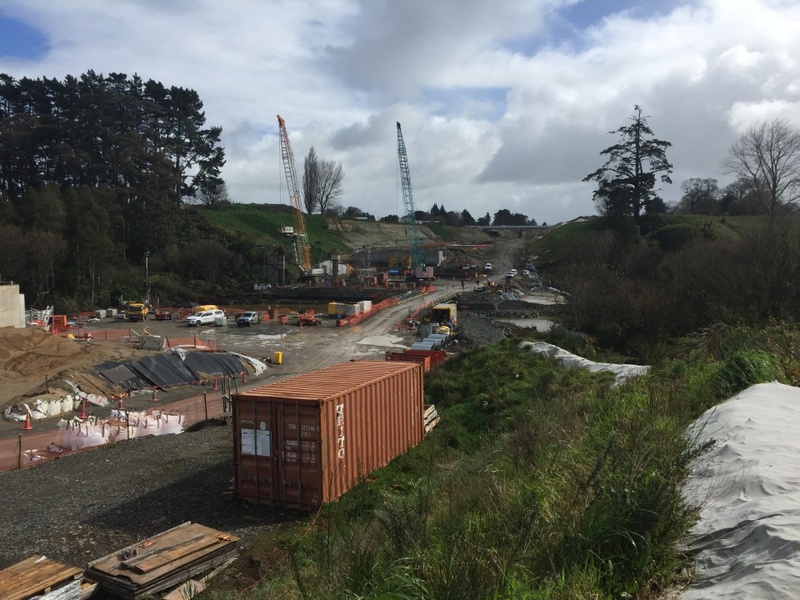 To find out how the Waikato Expressway has been designed to meet these needs you headed out to meet experts on the expressway construction site. You met with Stephanie Kirk who is an Environmental Advisor. You had to put on a high vis vest, hard hat, safety glasses and boots before heading out on site. Stephanie took you out to an area where she has been working. You could see an area of native trees that had been protected close to the construction site. Stephanie explained that when building a road people must take care of the environment. 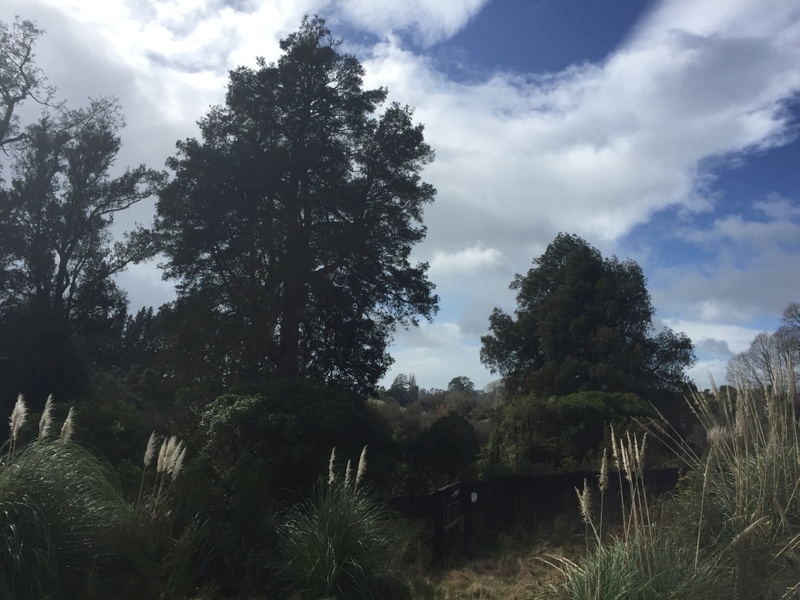 Before construction of the Waikato Expressway could begin surveys of the local environment were done to find out what lives here. Local lizards, bats and fish have all been relocated to safe nearby areas, so they would not be harmed during the construction of the road. Lizard hotels have been set up to give lizards a new home. Predators are now being trapped in these areas to increase the chance of survival of these relocated species. Once the expressway is finished weeds will be removed and thousands of native plants will be planted alongside the road. Watch the video to find out more. To create 102 kilometres of new four lane highway you need the help of lots of workers and technology. Hamish Utteridge showed you some of the technology used on site. You saw how a bulldozer can use GPS technology to automatically follow design plans. This means no mistakes are made and work is completed much more quickly. Large drones are used to take aerial photos and create 3D maps. This allows experts to see exactly how much soil needs to be removed without people needing to go out and complete surveys. This technology not only saves time and money, but it also leads to more accurate work. You can watch the video about this. Hamish took you out to the northern end of the Hamilton section of expressway to show you some safety features. You could see the long concrete barriers designed to separate traffic and prevent head on collisions. Other features such as reflective rumble strips, colour coded signage and wide shoulders make the road easier to drive. The road also has smooth, wide corners and fewer intersections to reduce accidents. You can see this on the video. The expressway has been designed to reduce traffic, travel times and the chance of harm to people if they do make mistakes. 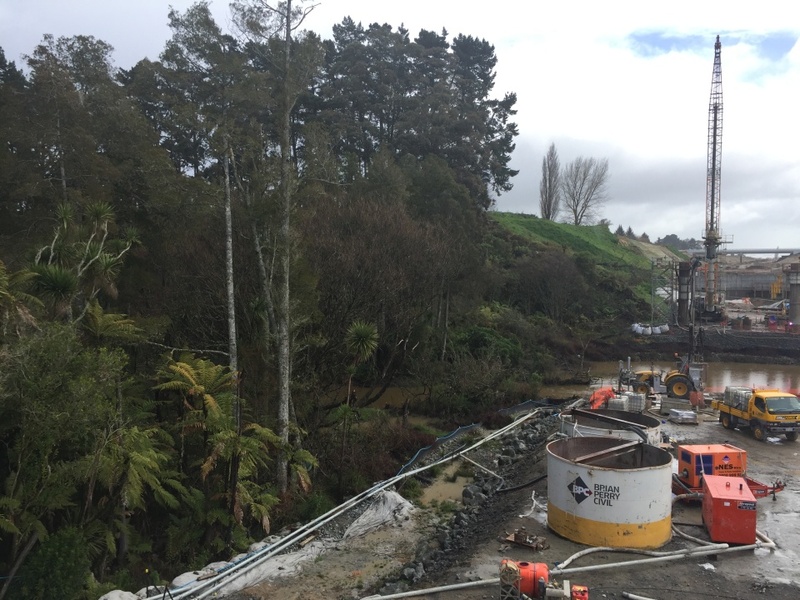 It has been interesting to see how much thought, effort and skill has gone into constructing the Waikato Expressway. It makes me wonder what our roads might be like in the future and how lucky we are to be able to travel so easily. Tomorrow we will look at how research is helping to improve road safety and meet experts from the University of Waikato. Shelley the LEARNZ field trip teacher. Bridget and Shelley talk to Jesse and Billy during today's web conference. Image: LEARNZ. Looking out over the construction of the southern end of the Waikato Expressway near Hamilton. Image: LEARNZ. 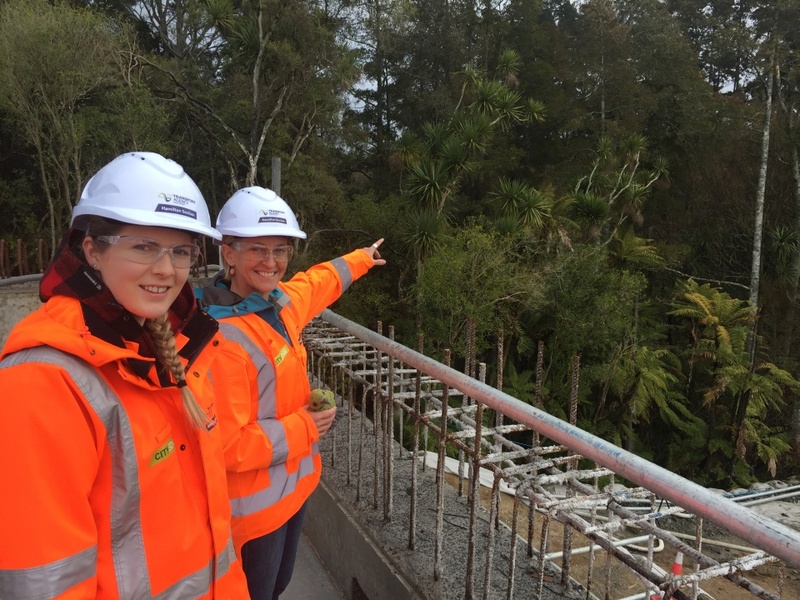 Shelley points out the native trees that Environmental Advisor Stephanie Kirk has protected during construction of the Waikato Expressway. Image: LEARNZ. Water from the construction site is held by nets so that it does not enter the stream. Image: LEARNZ. 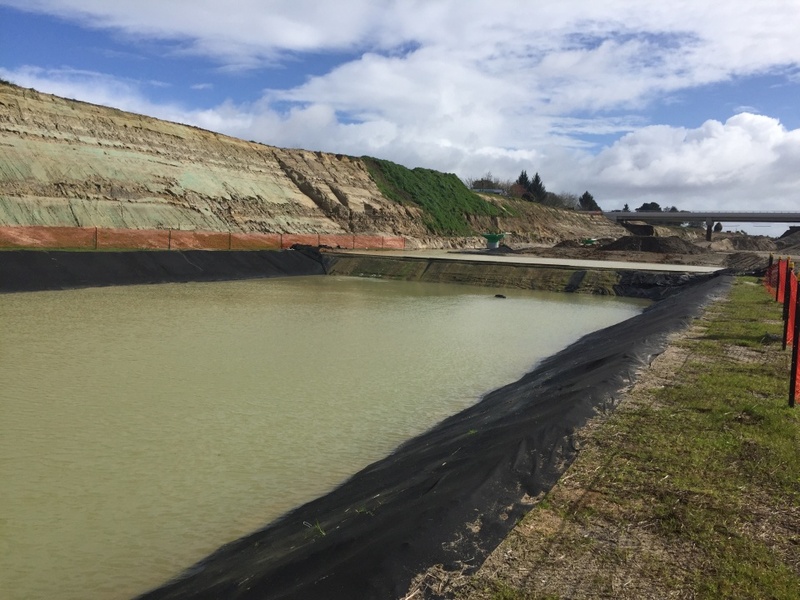 Ponds collect water from the site so that the sediment can settle out. Image: LEARNZ. You can see a fence which has been built to create a protected area for relocated lizards. Predators are trapped in this area to help increase survival of native species. Image: LEARNZ. 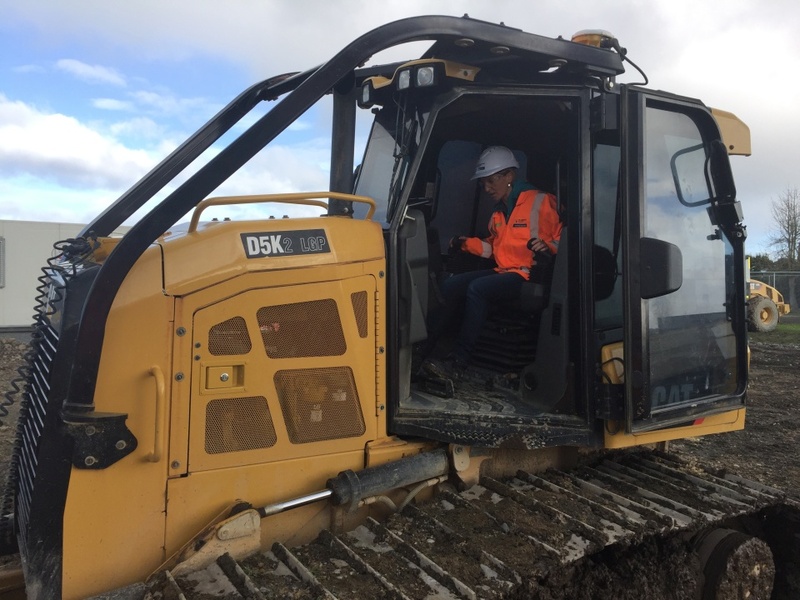 Shelley checks out a bulldozer which can automatically follow design plans using GPS technology. Image: LEARNZ. 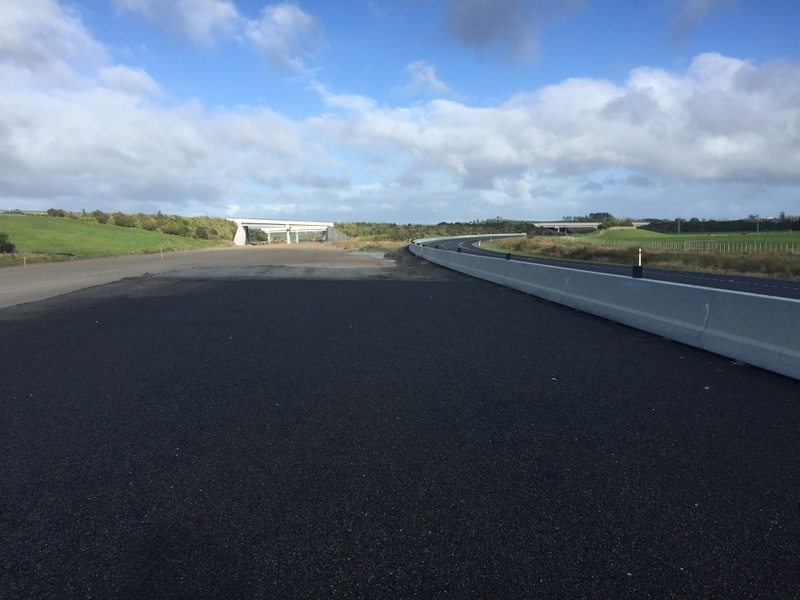 This section of the Waikato Expressway near Ngāruawāhia is being sealed and shows a concrete median barrier that improves safety by separating traffic. Image: LEARNZ.